Late Summer & early Fall Metal + Glass dates are up! 4 wk Metal + Glass course, etch, cast and more! Approx 4×5” piece of copper sheet, 2’ copper wire, sterling silver for 1 ring band, fine silver bezel wire to set 1 cabochon cut stone. Glass is included for casting/flame-working (whatever method is covered), silver solder to complete class projects, wax, bronze/brass for lost wax casting (20grams) & powdered vitreous enamel, 1 doz saw blades, 1 1mm drill bit, 1 half face particulate respirator, nitrile gloves, refractory materials for casting moulds. Students are encouraged to supply their own cabochon cut stones, crystals, rocks, etc. Additional materials not included: cabochon cut stone(s), sterling silver grain for lost wax castings, sterling silver sheet/plate for setting stones on/constructing other pieces. Sterling silver casting grain may be purchased at $2.50gram. The lab fees offer tools and materials for students to continue projects at home and start setting-up their own studio. Lab fee 2 (kit) Option 2 Please see below class descriptions for what is included in this option. All items come with a plastic tool box. 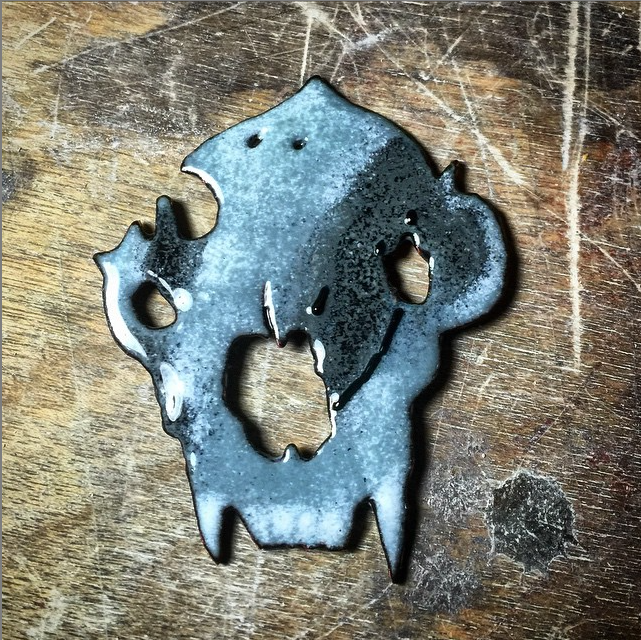 The studio is offering individual workshops in metal forming and fabrication/soldering, ring band forging, kiln forming or flame working, bezel setting stones, carving wax, lo-tech casting, etching metal, cold connections and more! Monday, May 15th or 29th- Form, fabricate (saw, drill): working with copper: safety, drilling, sawing. Adding textures. Make a pendant, cuff bracelet or a couple of rings. Heat colouring the copper, sweat soldering is covered. $88pp includes saw blades, drill bits, 2″ x 4.5″ piece of copper, silver solder. 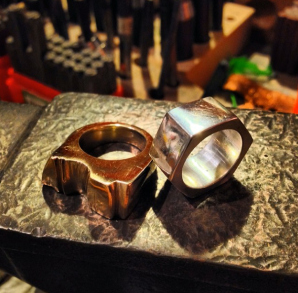 Wednesday May 17 or May 31st- Ring band workshop: Making a band ring out of silver (stamp, hammer finish, roller print, etc.) Learn how to properly size, measure your finger, anneal sterling silver, joint solder, form and finish a beautiful sterling silver ring! $88pp includes all materials to complete 1 ring band. Monday, May 22nd or June 14th- Kiln & Torch fired Vitreous enamel: Enameling copper projects, forming, how to make your own basic findings. Saw, add texture, form a pendant, add powdered glass enamel. $88pp includes enamel and 2″x2″ piece of copper, saw blades, drill bits. There is no soldering in this workshop. Wednesday May 24th or Monday June 19th- Bezel set a cabochon stone or flat bottomed crystal: Learn how to bezel set stones working with fine and sterling silver. Pendants are made in this workshop. $88pp includes all materials for 1 pendant. Wednesday May 24th or Monday June 29th- Bezel set a cabochon stone or prong-set a crystal/fossil: Learn how to bezel set stones working with fine and sterling silver. 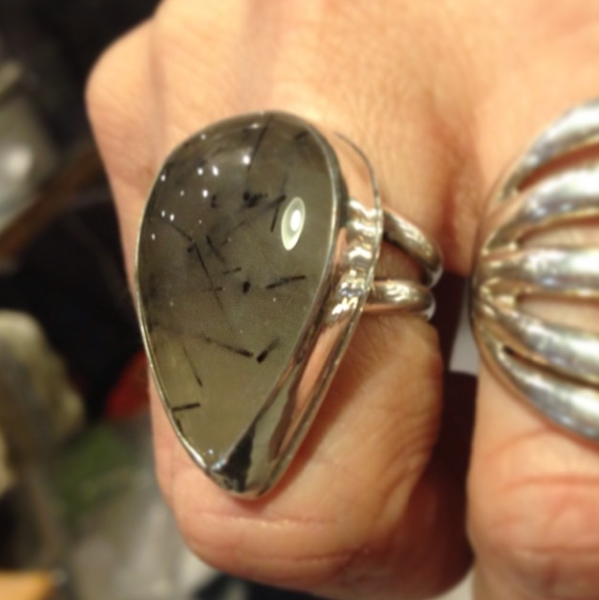 Rings are made in this workshop $125pp includes all materials for 1 ring with a bezel OR prong set crystal/fossil. Materials available for use include; bronze, sterling silver. A ring incorporating both metals is allowed! Register for the entire 4 week series starting May 29th: $275pp Again: zero experience necessary! Well, here’s some badass news! 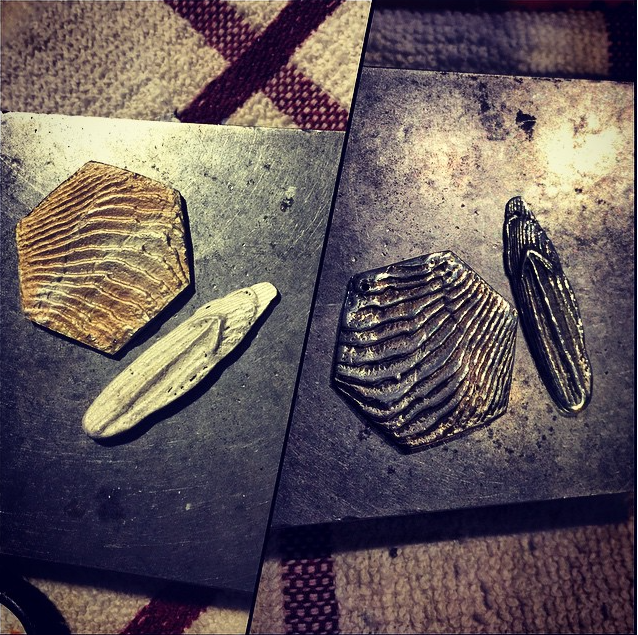 Starting August 17th the Metal + Glass course will include lost wax casting from start to finish! Below are full details, images and links to go register! Any questions? Please email me. Form • Fabricate • Cast • Fuse – Learn basic Goldsmithing + Lost wax casting glass – 6:30-9:30pm, 4 weeks, 2 evenings per week. – $285 per person, 6 people max, 3 people min. evening #3: Working with wax create pieces w/the lost wax technique- to be cast in Sterling silver in house. evening #5: One by one each participant casts their flasks and starts cleaning their pieces. Deposit of half down required to hold space. Registrants will be invoiced prior to first evening of course.